It may come as a surprise to you, but, you and I do NOT have all the answers and by design, we need help along the way. From the time we’re born until we depart, we need help from God and others in one form or another as we'll constantly experience situations, tasks, and circumstances where we'll need God’s wisdom and direction. We'll also need godly counsel from other's in the body of Christ. It's a lot like going on a road trip and unless you’re a rare individual that basically has a GPS embedded in their brain…you need at least some pre-trip planning. (OK, maybe I read and watch too much SciFi sometimes) :-) Not only what supplies to bring but also a general understanding of what the directions are and what direction you're heading. I remember the family road trips I went on when I was young, yes, I was young at one point in my life, and we used these things called MAPS… :-) They were paper and folded out so you could see the area you’d be traveling to and through including the roadways you needed. My family and I traveled all over the place with via maps We even went on trips to places like Yellowstone National Park and back as well as many other places. I still keep current road maps in my glove box as sometimes technology doesn't work and you still need directions! Now-a-days we have GPS technology built into our phones and other devices, but, a wise person stops and considers the directions and asks for directions as needed no matter if they use maps or GPS technology. Even using a GPS you have to look at the route so you understand enough about the route especially for a place you've never been before. Life is just like this as we need to continually seek wisdom and direction which in the life of a follower of Christ, always begins and ends with seeking God and His Word. 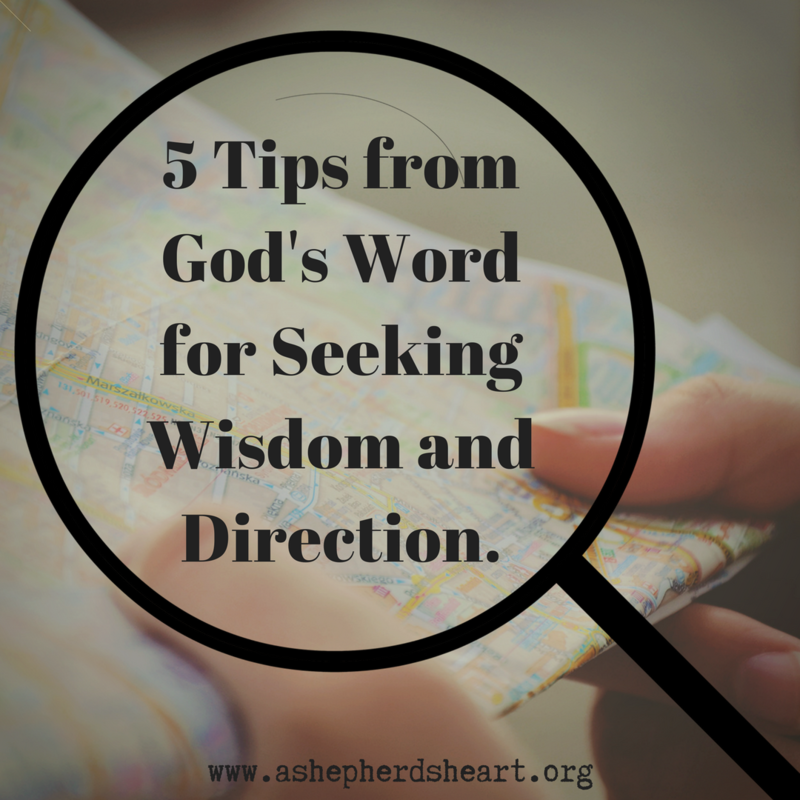 With this in mind, I wanted to share the following encouragement and starting point for your further study as you continue to seek God's wisdom and direction. 1. Wisdom and direction begins with The Lord. The Lord is trustworthy. You can trust Him more than anyone with everything that is within you, including your heart. He won’t leave or forsake you. He will never lead you astray. He invites you to trust Him. He instructs you to not lean your own understanding and He promises He will make the path straight. If you want true wisdom and direction, true insight or understanding for your life, having complete reverence for and fear of the Lord is important. He’s Holy, all knowing, and all powerful and you should have a healthy fear, awe, respect, and reverence for Him. You need to take Him at His Word. Seeking wisdom require effort on your part as well…you need to Ask, Seek, and Knock so you have wisdom and direction….everyone who asks receives, everyone who seeks finds, and everyone who knocks, it will be opened. 2. God wants to give you wisdom. God will not withhold wisdom from you. He is The giver of good gifts and you can ask Him for wisdom and He’ll freely give it to you! He wants to give you wisdom and just as Ephesians 1:15-18 states, that you will be given the Spirit of wisdom and revelation in the knowledge of Him! That you eyes of your heart will be enlightened and that you may be filled with great hope in Him, that’s my prayer for you as well! Make this your prayer! 3. Have confidence in approaching Him for wisdom and direction. God tells you to have confidence when you approach Him. So, have confidence in approaching Him in prayer and pray regularly! You will receive mercy and find grace in your time of need and this includes when you're seeking wisdom and direction. Also, as you read the scriptures, may Hebrews 4:1 and Psalm 143:8 be your prayer! Continue to ask Him to, "Show me the way I should go, Lord." And He will show you! 4. Seek and rely on The Holy Spirit for wisdom and direction. One of the key things The Holy Spirit provides is wisdom and direction. The Holy Spirit is constantly at work on your behalf. He intercedes to The Father for you even when you don't have the words. So, seek and rely on The Holy Spirit. Continue to daily pray, asking Him for wisdom and direction! 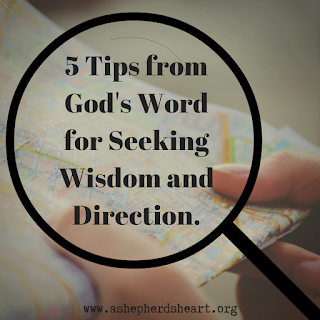 If you want wisdom and direction…you need to seek godly counsel. You need the counsel from God, His Word, The Holy Spirit and godly counsel from other followers of Christ. As you pray, The Holy Spirit will help you find the right counsel from the right people. Be wise in receiving their counsel and considering it while you make your decisions. Seek the right counsel, not just any counsel! The Lord Jesus, His Word, and The Holy Spirit are the chief sources of help in all things as they are vital in seeking wisdom and direction. God wants you to seek Him with everything that is within you and as you seek Him, He will give you the wisdom and direction you need. God also uses each of us in one another’s lives to provide godly, biblical and practical advice. Here's my prayer for you via Colossians 1:9 (ESV) "And so, from the day we heard, we have not ceased to pray for you, asking that you may be filled with the knowledge of his will in all spiritual wisdom and understanding,"
May you be filled in this way! Keep seeking His wisdom and direction all the days of your life! P.S. Please pass this encouragement on to someone else and please remember A Shepherd's Heart in your prayers for God's wisdom, direction, will, and provision!